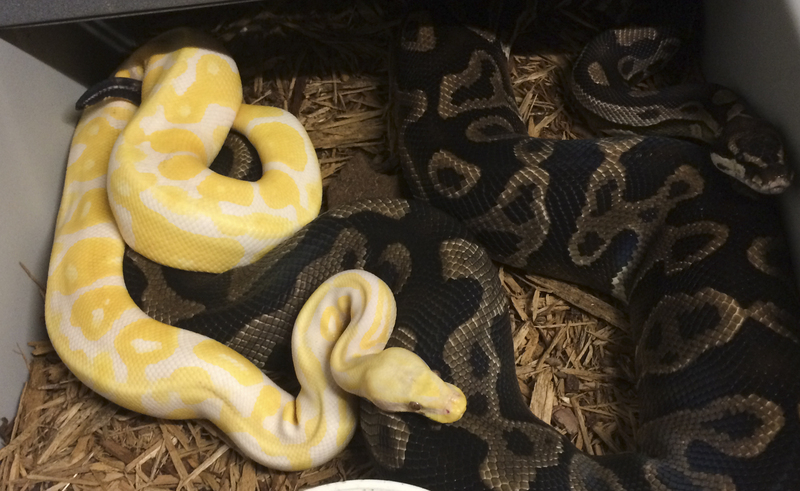 Volumes could be written about Ball Python feeding habits and their finicky ways… for a new keeper, the long feeding breaks they sometimes take can be quite unsettling. It is really hard for people who eat 3 meals a day to relate to an animal who may go 6 months without a meal. When I first began working with Ball Pythons I had a female go 13 months without a meal (with no visible health problems) before finally kicking back in and becoming a model citizen again. As a BP breeder, these long feeding breaks are an major obstacle to your goals, especially when its a key animal in your breeding plans. I completely understand! Over the past 10 years I’ve put together all sorts of tricks to work your snakes through these long breaks. I won’t be listing them all here, but rather the framework through which to tackle these issues. This is critical! Every species has a unique, built-in instinct. We want to get inside their heads and work that instinct to our advantage (and theirs!). 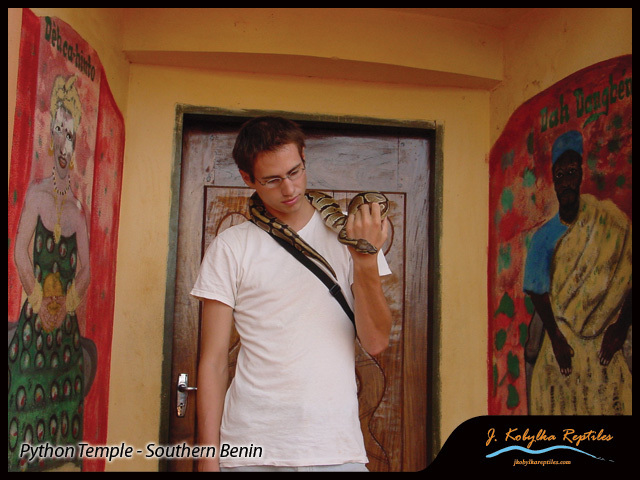 I lived in Benin, West Africa for almost a year from 2000-2001. Although my time there was not Ball Python related, I did get a chance to see them in their natural environment. They are reclusive animals, you can’t just go for a walk and stumble onto one. They spend the majority of their time underground in rodent burrows or abandoned termite mounds (which there are a LOT of). This gives them two advantages: Safety from predators and access to small mammals to eat. Photo I took in 2000 of a large termite mound in Benin, West Africa. After the burrow is clear (or maybe it already was empty) a Ball Python will set up camp at the bottom and wait for more rodent visitors to arrive. If the snake is to continue to eat well in that burrow it is dependent on one very important thing… smell. The burrow can’t smell like a snake. If it does, no self-respecting rodent is going to risk it. Ok stay with me here… When a Ball Python poops in a burrow, its really compromises its ambush position. A shed skin does the same thing. They are an advertisement to rodents that this burrow is occupied by a predator. I believe this is why BPs will often hold their bowel movements for long periods and also will almost always combine shedding with pooping. Once a shed or poop has been made, the BP will need to find a new place to occupy if it wants to eat. Think of this as “leaving its scent behind” and emerging in the best possible position to catch prey again. A few years ago I began experimenting with doing a complete bedding change every time they had a bowel movement (not just spot cleaning). I additionally scrubbed the tub well enough to remove any residual smell. My thought was this would simulate leaving their smell behind and being in a new hunting environment again. The results were significant. Across the board (rack), animals who were freshly cleaned ate dramatically better with fewer skipped than those that were spot cleaned. This was especially true if they had shed prior to cleaning. The next test was to combine the heavy cleaning with a rack & tub change. I moved any persistent problem eaters to a fresh, clean tub in a different part of the rack or even a rack across the room. This resulted in some of my toughest feeders slamming rodents at the next feeding opportunity. Contrary to popular knowledge, moving a non-feeding animal to a different size or shape tub or a different substrate type altogether will often further improve results. The more dramatic the change seems to the snake, the more likely it will view it a good feeding opportunity. Now, my routine on cleaning days involves identifying which snakes are entering an extended fasting period (3 skipped feedings or more) and move them to a different clean tub in the rack, even if their bedding is already clean. If they continue to refuse I will move them to a different sized tub (both smaller or larger tubs will often work). This is extremely effective for me. It means that a snake might move to a different spot 5 consecutive weeks or more before beginning to eat again. Its a very labor intensive process, but the results have been well worth the work. Very long feeding breaks are extremely rare. The concepts in the above paragraphs will over-time solve 90% of poor feeding issues by moving your animals more quickly through their refusal periods. 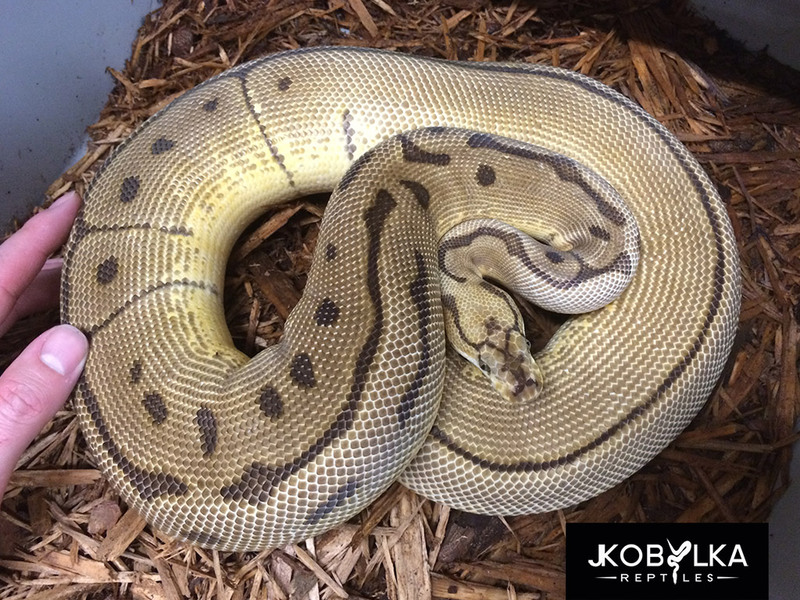 However, this strategy is no silver bullet, Ball Pythons still naturally take feeding breaks and there will always be difficult animals. The goal is make sure that these natural breaks don’t extend into habitual refusal. In my opinion, refusing food is habit forming. Look at it this way, Ball Pythons typically have a strong natural instinct to eat. However when they go off feed and week after week you offer them a rodent and they refuse, you are reinforcing a non-eating habit. This is why I try to get very proactive when a snake begins to refuse food. If I can’t get it eating relatively quickly I will only sporadically offer food so as not to reinforce non-eating habits. Its better have it refuse 8 meals over 4 months instead of 25 meals over that same period. Snakes are extremely vulnerable to predators while eating. Their primary defense (their mouths) is full and useless while eating. They also lose a lot of mobility in the process. Many problem-feeders can be traced to the fact that they are shy animals and may just be nervous with a huge human (potential threat) standing over it while eating. If you have ever made a sudden movement or startled your Ball Python while eating and it spit out the meal, it is because they are freeing up their mouth for defensive purposes. Minimizing your involvement with feeding is key with these animals. Try coming into to the room after the lights are off, stay out of sight (if the enclosure is clear). Let the rodent smell be in the room for a bit so your Ball Python can be prepared for the opportunity to eat, then drop the rodent into the enclosure in such a way that the snake isn’t aware of your presence. This is especially difficult to accomplish with frozen / thawed feeding, which I believe is why some BPs strongly prefer live prey. It is the human component that hurts the F/T feeding percentages…. This is also the #1 reason that removing your Ball Python from its enclosure to feed it isn’t very effective. Although it is often repeated, there is no benefit to feeding in a different enclosure. Offering a different prey item can really work, but is also a double edged sword. I feed rats exclusively my Ball Python collection because it provides a single prey item for them to learn and eat their entire life. You can feed one rat to them as hatchlings and one rat to them as adults. Many times I’ve fed a mouse or ASF to an animal that hadn’t eaten in 4 months and then the very next week it went right back on rats… it just needed a jump start. BUT… your BP may also become dependent on the new meal type and you’ll find yourself offering an adult BP 10 adult mice per feeding (expensive and very time consuming!) Because of this, I only recommend a different prey item after you have exhausted other options. Sometimes putting your animals together and letting them breed will stimulate feeding. In the female, I believe this triggers a biological instinct to add critical weight for the purposes of producing eggs. This can work with both males and females, however I wouldn’t recommend it unless you’re truly interested in getting a clutch from the animals you pair up, as sometimes they will surprise you even if the animal size or timing isn’t ideal. I hope these concepts are helpful and maybe will help you get creative in your own efforts. Do you have any specific techniques that work for you? Put them in the comments below! I would add that proper temperature is a key player in getting “trouble” feeders to eat. Your Ball Python is acting completely normal. Best of luck with it! Great tips Justin. I also have been breeding BPs for about eight years now and I have noticed the same things. I don’t worry about breeding males going off food…but it still makes me worry when females do it. I have always tried offering a different food item first, but since reading this, I think I will try the switching the tub option first from now on and see if I get better results. Awesome read will try these to get my male to feed! Interesting article. I will give this a shot. One question, you said it’s better to feed BP in their enclosure. My biggest worry is having a BP swallow some substrate. I use aspen shaving. What do you recommend? Hey jk …question for you that you didn’t say at all..do you normaly feed live? Hey Mark I wanted to chime in so you could have a quick reply ish.. When I was first starting out this was a fear of mine as well but you have to think no bedding that you could put them on is harder to break down then bones. Obviously its not ideal for them to eat the bedding but a small amount is no issue. Yeah, that does make sense. I fed my pythons and boas in a bin but as my collection keep growing, it is a pain and time consuming to take them out, feed them, and wait until they’re done. I’m going to start feeding them in their tubs and I should save a lot of time. I recommend repti-bark. Or put down a paper towel in the feeding spot. Aspen can really hurt them if the chomp down on it. It’s also worth mentioning, especially for newer owners, that the most likely reason why your new royal won’t eat is because there’s something wrong with the place it’s living in. Whether it’s noise, lack of cover, temperature, or whatever is up to you to find out and experiment with. This is a good and helpful article for those big long fasts though when it used to eat just fine! Your blog talks about trying different foods – I have a 2yr old male that hasn’t eatten in almost 3 months. I have tried frozen/thawed …. live ….. have tried to “brain” ….. used a toothpick up the nose to scramble whats up there …….. have even tried to dip the rodent in chicken broth! He will NOT touch food, and gives the appearance that he gets stressed inside of his clear feeding tub. Other then pet store feeders like mice and rat pups – what else could I try ?? I don’t recommend any of those methods. All of them have a very low likelihood of being successful. A feeding tub could be your #1 issue. Always offer food in his own tub where he is most comfortable. I only recommend offering him live rats and mice using the methods I’ve outlined above. Only in the rarest cases will this not work eventually. 3 months is also a very short fasting period and not a cause for major concern. Try feeding in the tank, don’t take it outside ’cause it already causes stress. I’ve tried feeding some of my snakes in tubs but they get nervous and refuse food while in their own tanks they feel more secure and focus on eating. Good luck. This is a very good article. Well thought out, and can help answer that difficult question we hear a lot. I had not considered moving them to a new tub, but it’s completely logical with all I know about balls. Would you allow me to reprint this article as long as I give you credit and link back to this page as the source? Actually, spot cleaning aside, I have got into the habit of cleaning out all of my royals the night before feeding or earlier in the same day and I do seem to have fewer refusals since doing this. The percevied wisdom is that disturding them like this close to feeding should have a negative effect, but it certainly doesn’t. Sorry about the typo – disturbing. Lots of great info to try. Our bp has only eaten once in the last 3-4 months. We handle ours regularly, but not too much as to stress him out, so we feed in a feeder tank so it minimizes the concern of being struck at. I will try today to thoroughly clean the feeder and leave him in there for a while before introducing the rat, we only feed live. Good luck! If you don’t have success feed him in his own enclosure. That’s most likely your #1 issue. The cage aggression argument for feeding outside your snakes cage is a myth. Great tips Justin! I’ve just tried the tub scrubbing and bedding change to my Mrs. Butterpastel who were in a stop period… and it perfectly worked! I’m suggesting the same method to my friends and I’m linking them this paper aswell. Great job mate, thanks a lot! I found this very informative. Thank you for sharing your insite and experience. I have a very young ball who ate well 2 – 3 times after I purchased him and has refused for a couple months. Will try your sugestions. Lots of good info, I have a 1000 gram female that has eaten live twice for me since I got her just over a month ago, then refused two meals. I did a full cleaning as noted above. These were not outright refusals as she struck both times but did not follow through. What are your thoughts on this before I try again. Thanks for writing this up. I have a grown female who has never eaten for me over the 8 months I’ve had her and I’m worried (though she seems fine otherwise). I look forward to putting some of your suggestions to work. Great article and a lot of helpful info. I’m caring for my sons BP while he is deployed over seas. This is the first time I have cared for a snake. I’ve taken care of different types of lizards, rabbits, hamsters, fish, dogs etc. (you get the picture) but this is the first to have such picky and problematic eating issues. About a year and half ago I fed her a live small rat . The rat put up a fight and scratched the roof of her mouth causing an ulcer to form. I took her to my vet who specializes in small critters and she found the damage in her mouth. So after the visit and medication ($$) it healed. Four and a half months after healing she started eating but the only thing was she would only eat frozen (thawed). No problem for me but my son wasn’t happy about it. She ate good with no issues for about 5 months. Then she went off feed and hasn’t eaten in seven months. I tried going back to live (smaller), frozen mice, after defrosting I even used my hair dryer to keep the temp of the thing up to live temp. Still no good. I’m going to give a few of your suggestions a try. Thank you, thank you. Have you heard of force feeding and what do you think? I wrote a quick “10 things to consider” when it comes to dealing with problem feeders here: http://www.rierareptiles.com/ball-python-feeding-issues.html It has what i feel are the more common ways to deal with reasons a ball python might not eat. For the most part it has been pretty good for me, but there are always those select few that will have me scratching my head. I found your experiment very interesting, Justin. I’m definitely going to try and incorporate the new tub/substrate technique for a problem feeder i’m currently dealing with. Well, she’s not really a complete problem feeder. She can definitely chow down on live, but when it comes to frozen, she is not having it. I feel pretty fortunate to have pretty good eaters and i would say that habituation of my presence has been on my side for the most part. I’m always opening my tubs, looking, and petting, all for just a brief moment. Aside from exposing myself to this problem feeder more often i’m still trying to turn on her F/T switch. Maybe the trick you mentioned in this article will help :). Thanks for this article, I have a 12 year old bp that hasn’t eaten for five months now and I’m gonna try out these techniques. But I have an additional question; right about when my snake started fasting, one of the mice I was caring for gave birth to some pups and I’ve been caring for them ever since. Due to lack of space, I’ve had to keep both my snake and the mice in the same room. Do you think the constant smell of mice could affect his eating behavior? I’m going to try and separate them soon and incorporate these techniques! Having the rodents in the same room can definitely be a factor, gotta eliminate the possibility at least. check out my tips in the article above 🙂 I’d also try a live hopper mouse. Let me understand. You have a 6 week old baby ball you purchased(/) and it hasn’t eaten for 3 weeks? The breeder that sold this to you sold it way too young. This is very irresponsible. By the age of 3 weeks, it should be just about ready for it’s first meal, a hopper mouse. The it should not be sold to an inexperienced owner for at LEAST 2 more veracious feedings. This sounds like a breeder mistake. That said, go to smaller food, like a hopper mouse, that is small, yet fast moving to catch the snakes attention, and don’t be pushing food at him him every few days. Give him peace and quiet, don’t keep holding him, or taking him to the vet. If it’s getting to a life threatening point, he should be assist/force fed by someone who knows what he/she is doing. I definitely would recommend both live feeding and different feeder sizes. Any change in what you offer will potentially pay off. I’m pleased and impressed with this article my man. I am a reptile enthusiast. Though not a breeder, but a proud owner of 2 green iguanas (both about 17 yrs old), a rapidly growing Red tailed boa (about 5.5 yrs old), and my precious female ball python (also about 17 yrs old). All of them I’ve had since they were babies. And I too, from time to time, experience these feeding difficulties. She’d sometimes turn down all white feeder rats and any that were 1/3 or more black patterned she’d devour right up. I know snakes don’t see a color difference. Just kinda odd though. Well anyway, take care and thanks again for the info. Thank you for this article, I hope it will help me. I got a ghost morph last February and she will be two in November. She goes through phases of eating F/T rats and fasting. She stopped eating the F/T last October, she didn’t lose too much weight, she seemed pretty normal, kept fairly normal sheds, then after one of her sheds she retained her eye caps and started wheezing so I took her to my vet. Dr Eva helped me learn so much, I was doing a couple husbandry things wrong – I fixed my ways and after some antibiotics and tube feeding – she was good to go – 5 weeks of stellar feeding – fresh killed ASF’s – now, we are back to square one – she never really stopped wheezing – only hear it sometimes, stopped eating altogether, lost all the weight she put on – i can visibly see her spine and feel her ribs. I don’t know what to do. I will try a full clean of her tank and stop the spot cleaning. I keep offering her rats – fresh kill and F/T weekly – she has no interest – i will try in her tank as opposed to a feeding box. I want to keep tube feeding her because it works – she gets strong and healthy but i don’t want to that for her whole life – I’m hoping i can try use the principal of your advice to get her eating again – it will break my heart to give her up because i can’t take care of her or worse – she dies . Sorry to hear about your trouble. Its probably best to keep working with a vet to get the RI cleaned up. That’s likely the root of your feeding troubles in this case. You have a non-typical situation that really needs a vets input. If you want the best reptile vet possible, I’d recommend Dr. Stahl in Virginia. You can google his contact info. Thanks for this helpful article!! I just got a baby opal diamond ball python on Saturday, born this year in July. The breeder told me that the ball python was around 5 to 6 weeks old. He was fed live mice and rats. Supposedly he ate last week Monday, so I tried giving him this Monday a frozen-thawed mouse, no success. I left the mouse in the cage overnight, but it didnt help. On Wednesday tried again with a black mouse, this time had the mouse warmer, but still he wouldnt take it. I dont think he is losing weight, but I am going kind of frantic with worry because I am in a situation where live rodents are practically impossible to get, and also because I have no experience with snakes…..Tomorrow I will try moving him into a smaller, styrofoam box and try to feed him baby rats…Otherwise I have no idea what to do! Offering your BP a live mouse hopper is the answer! You can’t force f/t on a bp, especially not hatchling that young. Hey Justin, have you ever done any experiments involving mice vs rat feeders? No official research. Just what I’ve noticed through the years. Thank you for the article and I feel better. Lightening is my first ball python. He is 4 years old and before October, he missed a total of 3 meals. Lightening went through a enclosure change (bigger tank) in November, and has been active but hasn’t eaten since October. He eats F/T small eats. Oh! He bit me because I cleaned his tank and startled him. I didn’t know if this would be a reason or not also. I tried feeding him today once again, left him alone in the room, and 40 minutes later he bit the rat, but hid under his rug near his heater. I am worried about Lightening. He has a temperature gauge with a hygrometer. He is at 85-90 degrees and is just at the line between desert and tropical. He is quite docile, and I have always been able to handle him. I would recommend putting him back in the smaller enclosure. Feeding breaks often occur after a caging change they they are uncomfortable with. Great article, Justin! One thing I’ve always done, not just with balls, but boas, other pythons and colubrids is when I bring one home, after several hours I feed them. Over 90% will always eat at that time. To me, it’s a sign of a healthy snake. That doesn’t mean if they don’t eat, there’s something wrong. I’m always happy when they eat right off and can digest while they’re settling in. I do have one question that I really haven’t found an answer for: as far as hatchling balls and their first meal……if they don’t eat, how often are you offering prey? Every few days? Several days? Week? . I haven’t found anything on that. Just checking. I try every few days but maybe too often? Thanks! My 2 year old 1800 gram Champagne Pastel male refused a couple of meals recently, no warning, no husbandry change, temps and humidity unchanged. The problem was that his tub was too small—he had outgrown it. Got him a nice big tub where he can fully stretch out, two built-in hides (warm and cool), and now he is a happy camper. Ate a pre-killed medium rat last night. Thanks again Justin for another great article. Extremely well-informed article to help me (a newly found BP owner of only a few years) ease their mind. It’s been about 2 months and this is the 5th meal they have refused. My guy has never been a big eater but I just happened to clean the tank/do a bedding change beforehand last night so hopefully that helps. I have a almost 2 year old pastel. He has not eaten in 3 months and I have him in a separate tub to feed. His humidity and temperature is fine and he is not sick. What is going on with him? Using a separate tub to feed may well be your issue. I was given a 2 year old BP about 2 months ago. She was eating great since she was raised on live not f/t. She ate just fine, until about a month ago she just stopped. I took her to a vet. They siad she was healthy and she’s not stressed out. Just will not eat. Any suggestions on how to get her feeding again. This is my first snake and we have already bonded! I would advise you follow the ideas given in this article.